Mark Twain (1835-1910) and Charles Darwin (1809-1882) met only once, but Darwin influenced Twain’s work and view on society, while Twain was one of Darwin’s favorite novelists. 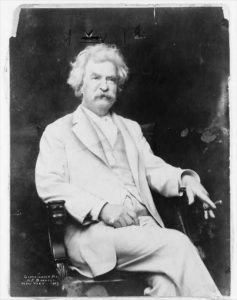 Golden has explored the unexpected connections between two Victorian intellectual titans, examining the full range of Twain’s writing, from fiction, travelogues, philosophical works, social commentary and personal correspondence. It shows the enduring relevance of Darwin’s thought and the surprising depth of what, on the surface, seems like simple humor. Join us as James Joseph Golden, director of education at the Mark Twain House and Museum speaks about Twain’s work and Darwin’s influence.